Cow parsnip found by Lake Bluff resident. 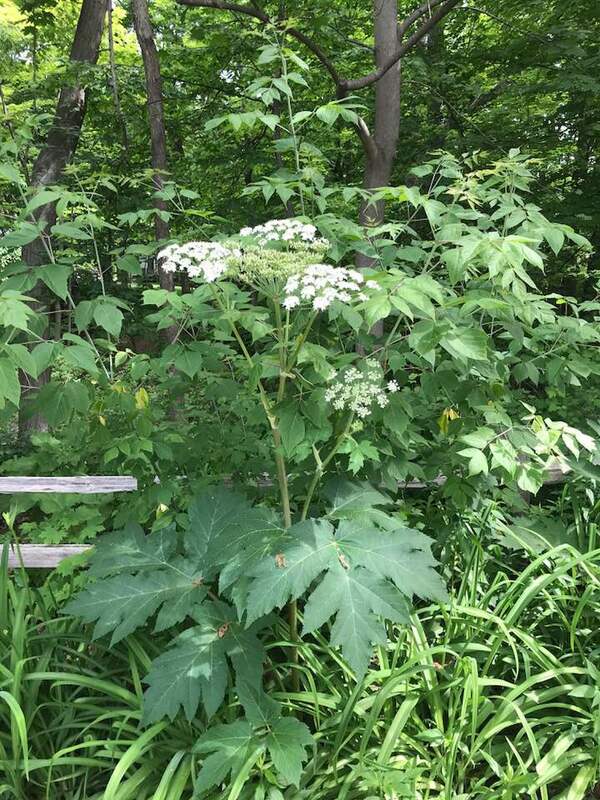 Lake Bluff resident Lise Dominique recently stumbled upon something worrisome while out walking dogs — a plant called cow parsnip, which causes skin irritation and blistering burns on humans and animals. She had previously seen one plant last summer, and this summer in the same spot saw three separate plants. Dominique brought the presence of the plant to the attention of a local Facebook group. Upon discovering it, she thought it may have been hogweed, an extremely rare and harmful invasive species native to Central Asia and invasive in the United States. Hogweed causes third-degree burns and deep scarring on the skin and can even lead to blindness if any sap enters the eye. Recently, there has been a large outbreak of hogweed in Virginia, with several burns reported. Fortunately, plant identification experts from Lake Forest Open Lands Association and Lake Bluff Open Lands Association, as well as the Chicago Botanic Garden, agree that the plant found by Dominique is not hogweed. Instead, it’s a similar plant within the same family called cow parsnip. This is not an invasive species, though it is not extremely common, and is less harmful than hogweed. While the two plants share several features, they can easily be distinguished by their size. Cow parsnip grows up to six feet tall, and hogweed (often appropriately called “giant hogweed”) can reach heights of 18 feet, with leaves measuring five feet across. Cow parsnip can be identified by its six-foot height and its large umbrellas of white flowers, similar to Queen Anne’s lace, though much larger. The flower clusters can grow up to a foot in diameter. If you believe you have found cow parsnip in your yard, treat it with caution and do not touch it. Do not mow, cut, or weed whack the plant, as this can lead to the spread of harmful sap. The best removal option is to consult a plant specialist, who will use herbicide to kill the plant and then safely remove it. In the long term, pulling the flowers off the plant for a few consecutive years could eliminate it from the property without the use of chemicals, but this would mean keeping the plant for at least three years. Cow parsnip can be especially harmful to dogs if eaten, so keep an eye on your furry friends during their walks, and check yards for any new growth. I think I just spotted what appears to be cow parsnip in Lake Forest on the south side of Old Elm between Greenbay and Timber. I think this property is adjacent to Old Elm golf course.